As we get older, we need goals. Annual goals. Gone are the days when just searching and hunting for their daily food was a priority. Golfers like to “shoot their age” meaning hitting a 75 at age 75 on an 18 hole golf course… most likely from the red tees! But for Masters track, what are the new goals when you turn 50? 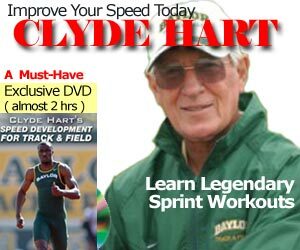 Especially for an aging 400 meter sprinter? I’ve talked abut attrition is several past articles, so this article is another reality check. Especially since this is September and it’s time to start the annual plan for next year. A few years ago, a reader mentioned a 400 meters Run-Your-Age award when your 400m time (in seconds) matches your age (in years). Let’s say 55 seconds at age 55. But is that really a viable goal? Can I really run 55 seconds for 400 meters at age 55? Maybe 60 at 60! You can’t fool the clock, or Mother nature as well. My best 400m open time was about 4 seconds slower than the WR (43 high vs 47 high). So that means, given the normal attrition rate, I’d be 4 seconds slower at M40 or even M50. Yes, there are freaks in the world who defy this rule, and I say, congratulations, you have found the Fountain of Youth. But this is my reality check. 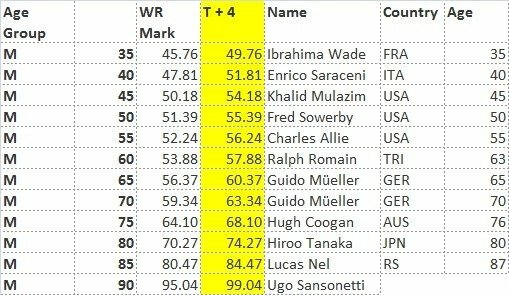 NOTE: Douglas Kalembo’s M50 400 meter world record of 49.86 is still controversial, and therefore not listed. He would be the winner of the 400m run-your-age record! 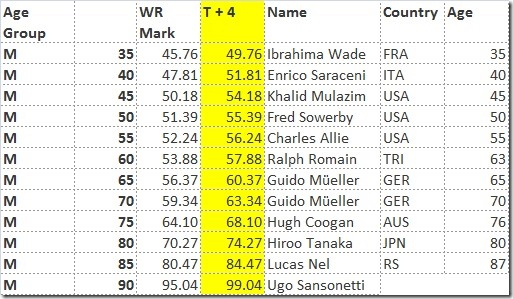 The table above shows my “what if” scenario of 5 year age group WR with 4 seconds added as my target (highlighted in yellow). At M40, I could run 51.81, and I ran 52.6. Maybe WR + 4.5 seconds should be my goal? So at M50, that means a 55 mid or 56 low is in the cards. Of course, we can’t forget about Kermitt Bentham who ran 53.75 of the Thames Valley/Southern Counties Vets club this year, and he’s 53! So something tells me that 15 at 15 isn’t really in the cards. As someone who started sprinting three years ago at age 58, with no track history in my youth, my modest goals are the elite world records X 2: 100m 19.16, , 200m 38.38, 400m 1:26.36 ! In our country, 62-year old Wim Threels always finishes his 400m in less than a minute. for the 400m …..terrific … marvelous … !